September 17th 2013 seems so long ago, doesn't it? Patience has prevailed as the day has finally arrived for the Grand Theft Auto PC community as GTA V has released worldwide on computer platform. With stunning upgraded visuals and new features such as custom radio, additional music and the hotly anticipated Rockstar Editor, the PC version promises to be a delight! Whether you've downloaded digitally or you've obtained the 7 disc beast of a physical version, we're told there is 5GB release patch on install, so you may have some additional waiting time before playing. You can read more about this here on GTAForums. Before opening the game, you may wish to update your graphics card drivers. Click here for Nvidia and here for AMD, both of which have been optimised for GTA V.
Now you know we all love Rockstar, but it's impossible for release day to go completely smoothly. 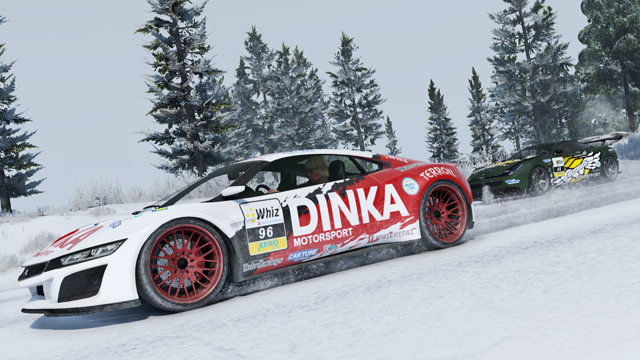 We're hearing reports about stuttering, crashes and Social Club problems from some players. The best thing to do at the moment is a) have (just a little more) patience! and b) check Rocsktar PC support. There are pinned topics highlighting known issues or you can submit a ticket if you can't find what you're looking for; it's likely they are working on bug-fixing patches as we speak. Additionally, head on over to the PC section of GTAForums to report and share problems you've faced and discuss with other players. If you're wondering how well other players are performing, or what you'll likely to be able to play with your own specs f you haven't quite installed yet, share your average framerate with the community. If you're already in awe of the game and have taken a few hundred Snapmatics, why not share them? If angles and lighting is your thing, join the Professional Snapmatics weekly contest and share your artistic snaps, while all general screenshots can be shared right here. With GTA Online available from day one, we've got the difficult choice of story mode or multiplayer on first playthrough. Whatever you pick, head on over to the GTAForums Recruitment forum if you're looking for crew mates or need some additional players for your own crew for once you get online. 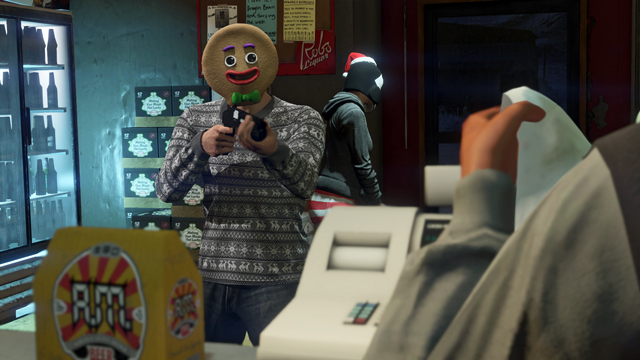 Heists will also be available from day one, so you'll need some trusty friends. Be sure to check out the GTAForums Official Crew as well if you want to wear our logo! Keep checking back as we'll be reporting on updates and patches as and when they happen during the next few weeks! Rockstar Games have just sent us across this exclusive PC screenshot to treat the GTANet and GTAForums community in preparation for the PC launch on Tuesday. 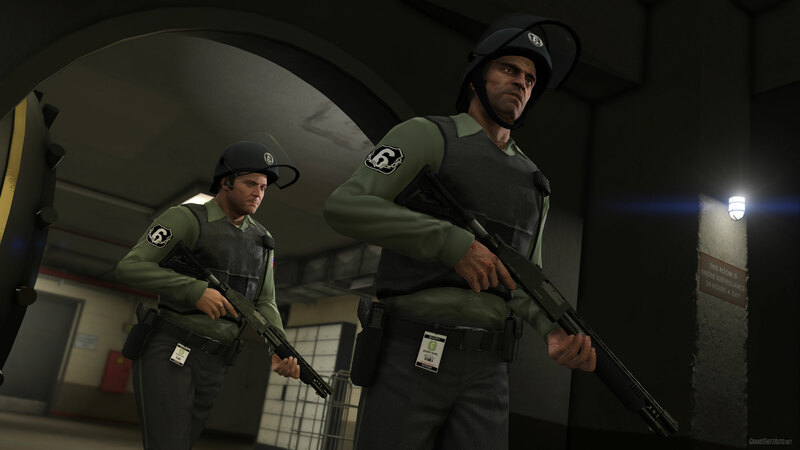 It shows Michael and Trevor kitted out in the Gruppe Sechs uniform, ready for a heist. You can get a look at what is to come by watching the PC version in all its glory in the stunning 60 FPS trailer that was released last week. We've also been treated to some previews and unreleased screenshots today as we enter the final countdown. Find the links below and discuss on GTAForums. The digital download of GTA V for PC became available yesterday on Steam and the Rockstar Games Warehouse. It'll allow you to download the core game files to save waiting on release day. It might be a tease as it sits in your library, but it's a good job as it comes in at a whopping 60GB. For those that prefer the physical version, you may want to check your letterbox is big enough as early pictures have shown the case looking a little chunky as it contains 7 discs! surely a record breaker? The PC requirements were released a few months ago, which you can find below. If you're still not sure if your graphics card is up to scratch or if your processor is powerful enough, head on over to the GTAForums community and post your own specifications; the community will be able to help give you a fair idea of what settings you might be able to run the game at. ...Will be playable from day one for PC and it'll support 30 player lobbies. 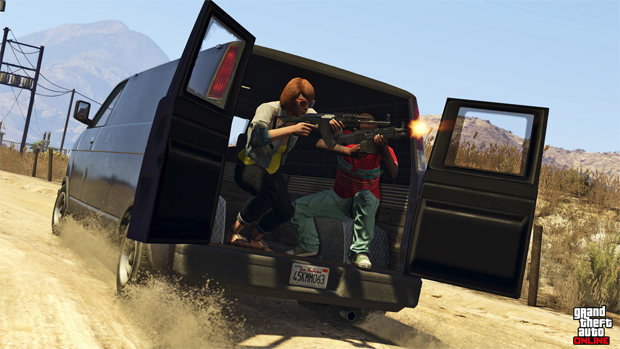 All previously released updates, including the latest Heists DLC, will be available on launch. As a returning player, you will also receive the one-time bonus of transferring a character, your progression and money from a console platform to PC via the Rockstar Social Club. It's been confirmed in one of the previews today that GTA V for PC will have an "independent" soundtrack; that is, a streaming channel filled with all your of own music, and there is even an option to retain adverts and blurbs like a real Los Santos radio station for the true GTA experience. Rockstar have also added even more music with a new radio station called "The Lab". If there's anything else you need to find out or discuss, be sure to bookmark the GTA V for PC dedicated section on GTAForums. You can be sure the community will be very busy with all the latest information as soon as the game drops next week, and the GTA Mods community will be also on hand to offer much anticipated creations and support in the world of modding. Rockstar has this afternoon announced that GTAV for PC will not be releasing in 2 weeks as originally intended, but instead launch this spring on Tuesday 24th March. Alongside the release date announcement, we have the long-awaited PC specs / requirements as well as confirmation that GTA Online will be available from launch day with 30 player lobbies and heists. We've also been treated to some very glossy screenshots showing off the PC version's capabilities of 4k resolution, as well as as a tidbit on the Rockstar Editor, an all-new video editing feature. Discuss the delay and PC specs over on GTAForums! 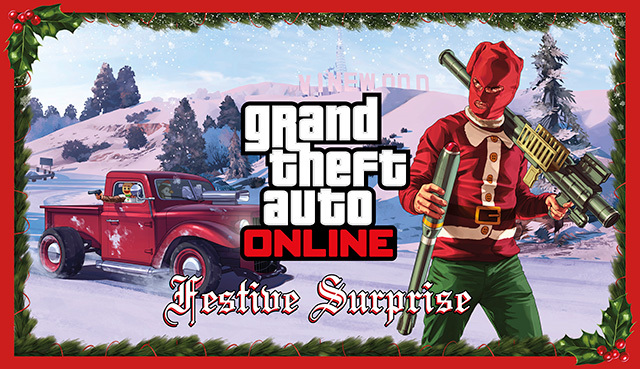 Christmas is nearly upon us and Rockstar Games are spreading the holiday cheer with a brand new Christmas themed "Fesive Surprise update featuring some brand new content to make the holiday season in Los Santos one to remember. Don we now our gay apperel..and Gingerbreadman masks indeed! 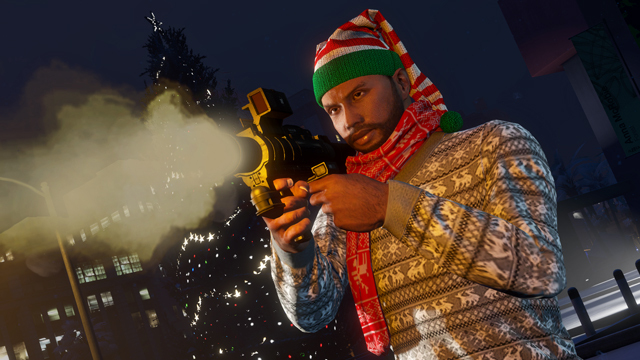 Included in the update some wonderful seasonal-only must-haves for your character's GTAO wardrobe including holiday PJs, some dashing new hats, scarves, "ugly" sweaters masks and more. Best part? They're all free of charge. No silent night in GTAO with the new Homing Missile Launcher and Promiximity mines. What's Christmas without some shiny new toys! 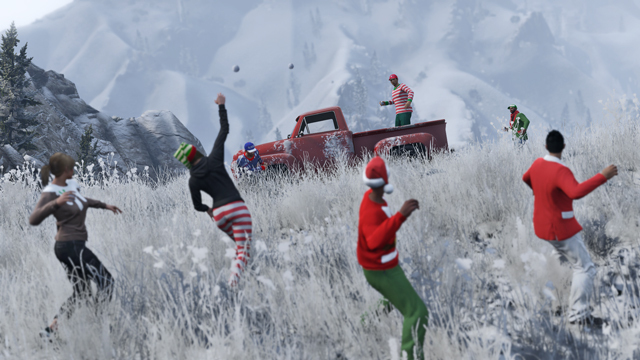 Whilst the new Massacro (sportscar), Jester (sportscar), Slamvan and Christmas Rat Loader likely won't fit underneath the Christmas tree in your GTAO appartment, they'll make for some wonderful new additions to one of your 3 garages. Also dreaming of a white Christmas? Look forward to some more literal snowy and snowbally goodness coming next week..
For a complete run down of what's included in the update and the fixes it brought check out GTAForums member SeaWallTx's awesome guide to what exactly has changed in the latest update. That's right, this is not an April fools joke! GTA Online Heists are finally releasing in the form of a 4-player co-op mode across all platforms in "early" 2015. We're guessing it could coincide with the release of the PC version on 27th January, but there is no confirmed window as yet. Check out the action-packed trailer released earlier today below, as well as heading over to IGN for an exclusive rundown and plenty of screenshots. Find below a quick summary of yesterday's next-generation previews released by CVG and IGN, along with the accompanying trailer and links where you can see all of the released screenshots. Look out for a PS3 vs PS4 gameplay comparison video, courtesy of IGN, a little later today! 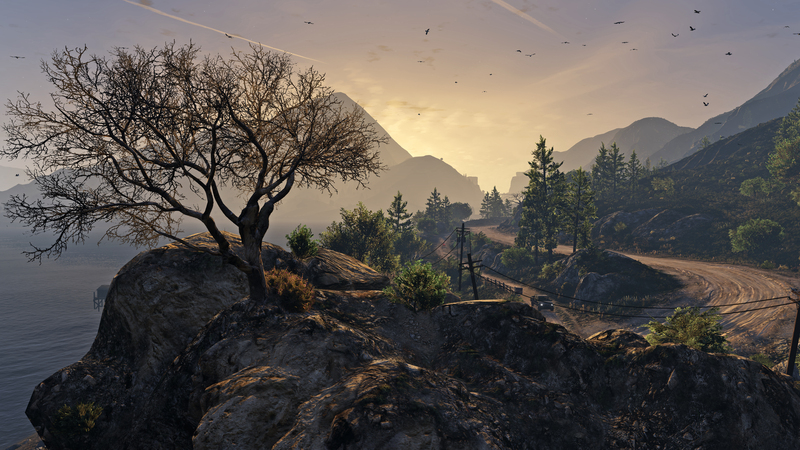 Some new previews have just released for the next-generation versions of Grand Theft Auto V. The most scrumptiuous information to date also confirms that we'll be receiving first person view across the game for the first time in the series.